Hundreds of people like you who care about water quality in their own backyards are volunteering their time to collect water quality data across Ontario, many right here in the Rainy-Lake of the Woods watershed. If you would like to be one of them, read on! The Lake Partner Program is Ontario’s volunteer-based, water-quality monitoring program, run through the Ontario Ministry of the Environment and Climate Change’s Dorset Environmental Science Centre (DESC). The program began in 1996 in partnership with the Federation of Ontario Cottagers’ Associations (FOCA) and the Lake of the Woods District Property Owners’ Association (LOWDPOA). 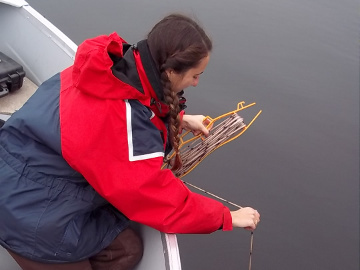 In 2016, almost 650 volunteer lake stewards monitored total phosphorus, calcium and water clarity in 550 inland lakes in Ontario at over 850 sampling locations. In the Rainy-Lake of the Woods Watershed, approximately 60 volunteers monitor total phosphorus and water clarity in almost 30 lakes at over 60 sampling locations. Volunteers collect lake water samples and return them, postage paid, to DESC. Total phosphorus and calcium analyses are performed in the DESC Water Chemistry Laboratory. The resulting data are used by members of the public, partner agencies, government and academic researchers and private consultants to assess and report on water quality in lakes across Ontario. These data are published each January on the provincial Lake Partner Program webpage. To register for the program or learn more http://www.desc.ca/programs/LPP.